daily timewaster: Roman Gold gets my blood boiling. Roman Gold gets my blood boiling. 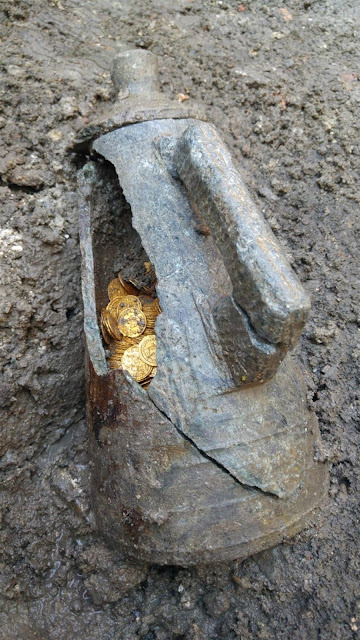 A unique hoard of gold coins from the late Imperial era has been discovered in downtown Como, Lombardy, northern Italy. The coins were unearthed on Wednesday, September 5th, in an archaeological excavation at the site of the former Cressoni Theater which is being redeveloped. They were contained in a soapstone amphora which has a big chunk missing so the pile of glimmering coin within was clearly visible at first sight. No kidding. That's treasure right there. Probably someone's payroll. So far 27 gold coins have been recovered and examined. They all date to the 5th century. Coins from this period are very rare because currency didn’t flow as efficiently through the imperial economic system. The quantity and quality of the coins are exceptional, especially for the late empire. The 27 were minted in the reigns of the Emperors Honorius (r. 384–423), Valentinian III (r. 425-455), Leo I the Thracian (r. 457-474) and his short-lived co-emperor Libius Severus (r. 461-465). Gotta like an emperor named "Leo the Thracian." If I were emperor I guess they'd call me "CW the Californian, Hammer of the Barbarians." There are an estimated 300 coins in the amphora (which is itself of major significance because it is of a previously unknown design), and not just coins. 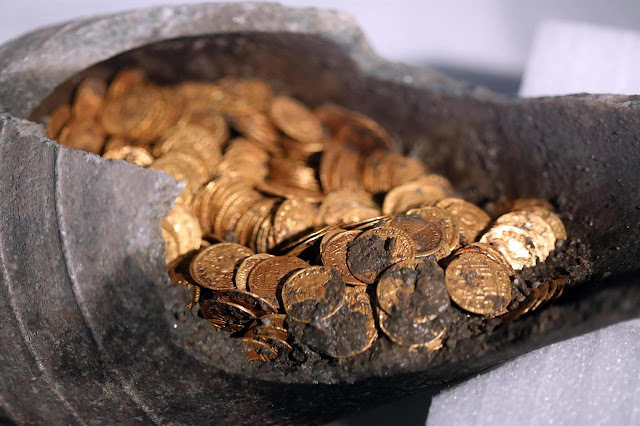 Archaeologists have reason to believe there may be other precious objects deep in the amphora hidden amidst the dense coin clusters, small pieces like pins, figurines and ingots. One gold bar has already been found and two other objects yet to be identified. Via the always good History Blog. What amazes me is the amphora. Imagine how many weeks it would take to chisel it out of a solid block of soapstone with nothing more than a mallet, chisel and buckets of elbow grease.